WATFORD CITY, N.D. (AP) — A crowdfunding campaign has raised more than $13,000 for a couple who lost their week-old baby when a tornado hit a North Dakota town. McKenzie County Sheriff Gary Schwartzenberger says the boy died after the storm flipped his family’s trailer Tuesday morning at an RV park in Watford City. The baby’s name has not been released. The Bismarck Tribune says Schwartzenberger reported to Gov. Doug Burgum and other officials late Tuesday that the boy was the son of Marisa Reber and Will Maguire. A GoFundMe account set up for the couple shows more than 225 people had donated as of early Wednesday. A relief fund for tornado victims has been set up at Cornerstone Bank in Watford City. Volunteers wanting to help with clean-up and recovery are asked to report to the Subway at 105 9th Ave. S.E., while volunteers with heavy equipment, light towers or other equipment are asked to check in at the Eagles at 1904 Main St. S.
WATFORD CITY, N.D. (AP) — A newborn baby was killed and more than two dozen people were injured when a tornado whipped through a North Dakota oil patch city early Tuesday, overturning recreational vehicles and demolishing more than 100 structures. Weather Service meteorologist John Paul Martin classified the twister as an EF2, with wind speeds reaching 127 mph. More than two dozen people were hurt when the twister went through the Prairie View RV Park in Watford City shortly after midnight Tuesday. Gov. Doug Burgum and Lt. Governor, Brent Sanford, traveled to Watford City Tuesday afternoon to survey an RV park devastated by a tornado just after midnight Tuesday and to meet with local response officials and residents displaced by the storm. More than two dozen people were hurt, at least three critically, when a violent storm whipped through a northwestern North Dakota city overnight, overturning recreational vehicles and tossing mobile homes, officials said Tuesday. 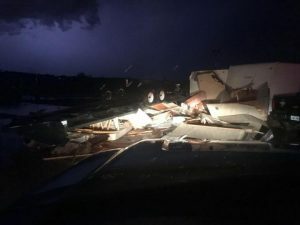 The storm moved through Watford City shortly after midnight, hitting an RV park the hardest, according to sheriff’s officials. About 20 of the 28 people injured were staying at the Prairie View RV Park where high winds overturned some campers and damaged mobile homes. Clifford Bowden, 37, was in his recreational vehicle when the storm struck. “My dog was with me and the next thing you knew the storm picked up my camper and slammed it on the ground. It felt like we were weightless,” Bowden said. He estimated 70 of several hundred recreational vehicles at the park were damaged. “It was scary. I feel like I’m a pretty tough guy. But, this storm, it made me shake uncontrollably,” Bowden said. At least three people suffered critical injuries, according to McKenzie County’s emergency manager, Karolin Jappe. “There’s more devastation than a tornado four years ago. RVs flipped over. Trucks underneath RVs,” Jappe said. McKenzie County Sheriff Gary Schwartzenberger says his house half a mile from the park suffered siding and shingle damage. The National Weather Service has yet to confirm that the damage in Watford City, about 160 miles (260 kilometers) northwest of Bismarck, was caused by a tornado. Schwartzenberger said the park residents would be allowed back briefly Tuesday afternoon to collect their belongings. He said the park would then be shut down and that cleanup operations would resume Wednesday morning. About 150 people, including Bowden, are staying at the Watford City Civic Center where the Red Cross has set up a temporary shelter. Lt. Gov. Brent Sanford has arrived in Watford City, where he was once mayor and where he still has a home, according to Mike Nowatzki, a spokesman for Gov. Doug Burgum.